feenon91: We met Superman Yesterday!! Filming wrapped Saturday at the latest U.N.C.L.E. location at Goodwood Motor Circuit. And while we didn't see set pics of Henry from there, we did get an update from a fan who got to see him at work Saturday. Watching Henry Cavill, Hugh Grant and Armie Hammer on set of their new film! Filming continues tomorrow! 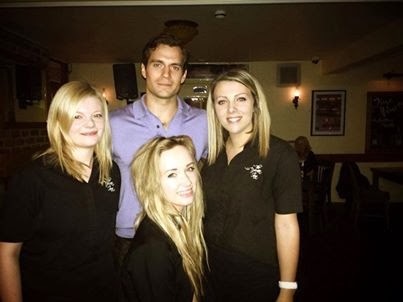 - on his night off Henry went to a pub and some lucky fans got to catch up with him. It looks like a busy week ahead for Henry, so it's nice to see him take a bit of a break. We look forward to bringing you the latest details and photos from the set of The Man from U.N.C.L.E.